Copyright/published Year: 2001 by Or-Cal Trails Assn. 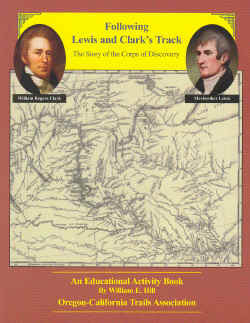 Description: Following Lewis & Clark's Track is an educational activity book created for the Oregon-California Trails Association. This illustrated 64-page book includes maps, word searches, charts, graphs, and puzzles. Excerpts from the journals provide insight into one of the most important events in the history of the United States. Ideal for middle and high school students. 68 pages including answer key.